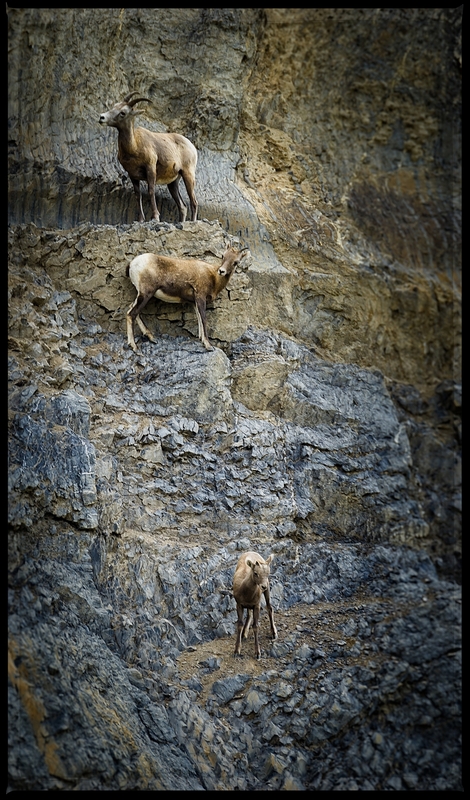 On my Facebook page I posted a sequence of four images of mountain sheep that caught some attention. People were curious about different aspects from capture to post production and I said I would follow up with some additional details on this blog. I hope I’ll cover enough insights here to help you out. 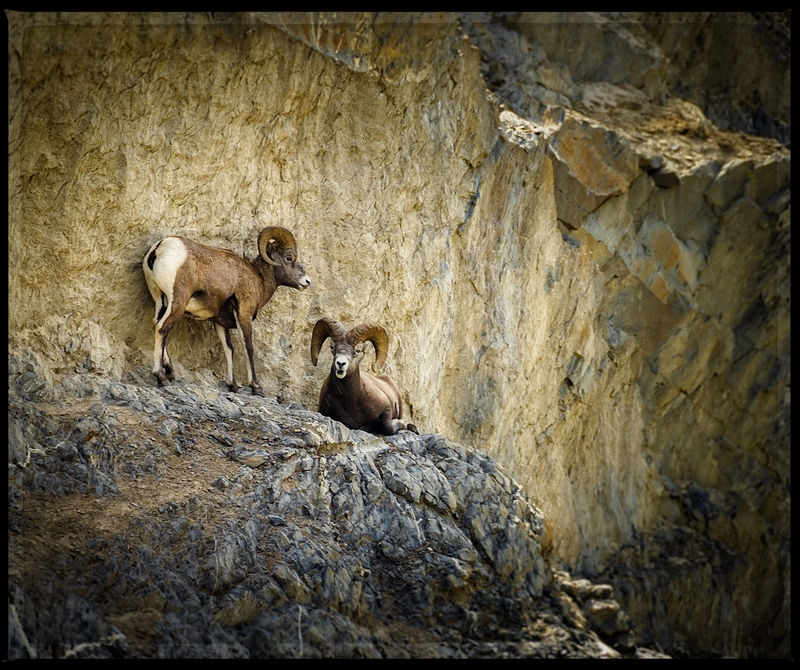 This sequence of mountain sheep images was taken mid August, 2006 during a period when I was deeply involved in observing and capturing wildlife in their natural environment. During my three year quest I was focused on the western foothills of Alberta and the eastern interior British Columbia. I tried to revisit certain areas to capture different seasons which also allowed the possibilities of seeing different migration patterns of the wildlife. On this mid August trip I was in the Jasper area on a favourite 10 kl. hike that takes me along the Jasper River running adjacent to the Yellow Head Trail near Talbot Lake. August is tourist time and the highway is always busy so I decided to find a more remote back road and head up into the mountains. I found an East bound gravel road about halfway between Jasper and Hinton that looked to be less traveled and headed East up the mountain. The road ended at an small unmarked gravel pad beside a mountain stream. The stream bed was barely running but I’m sure during the spring or a heavy rain it must swell up given the right circumstances. Looking West there is a deep cut in the rocks with a drop of 20 -30 ft. I thought this would be an amazing water fall with the right flow of water. In any event I started to walk up stream and I found myself in a narrow ravine cradled between to mountains, not exactly sure which mountains these were, I’ve tried to locate the road on satellite maps but to no avail. There is something to be said about being in a remote area by yourself. You either feel very peaceful or it can scare the crap out of you, this day was a beautiful serine day. One of the first things I like to do is sit a few minutes motionless, maybe feel the warmth of the afternoon sun and just listen, listen to the birds, hear the occasional rock falling in the distance and the trickle of the water just below my feet. Higher up in the mountains there is are unique weather patterns and this day had scattered rain showers that were a joy as the sun continuously broke through illuminating the drops on there decent. It was the sound of some frequent rocks falling that caught my attention. 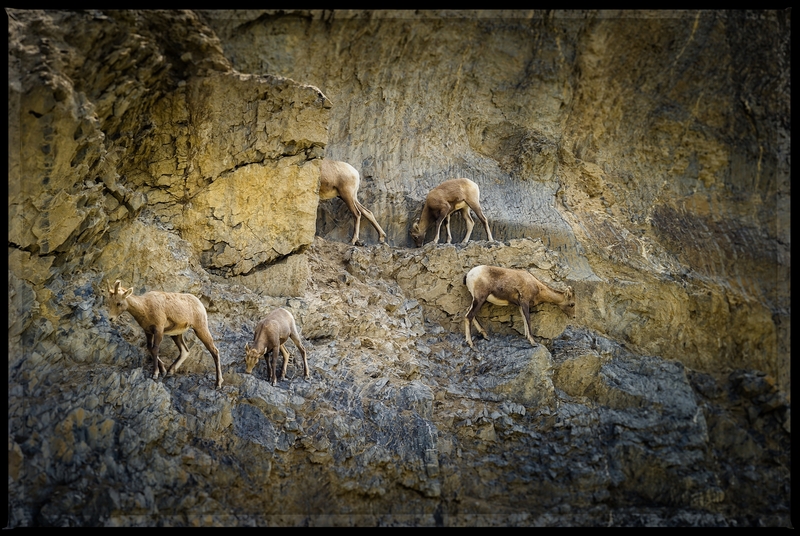 I looked in that direction and saw this small herd of sheep on the opposite side of this ravine. They appeared from behind a rock cut as if they were magically appearing from the rock face. I surveyed possible vantage points that wouldn’t disturb them and slowly made my move. 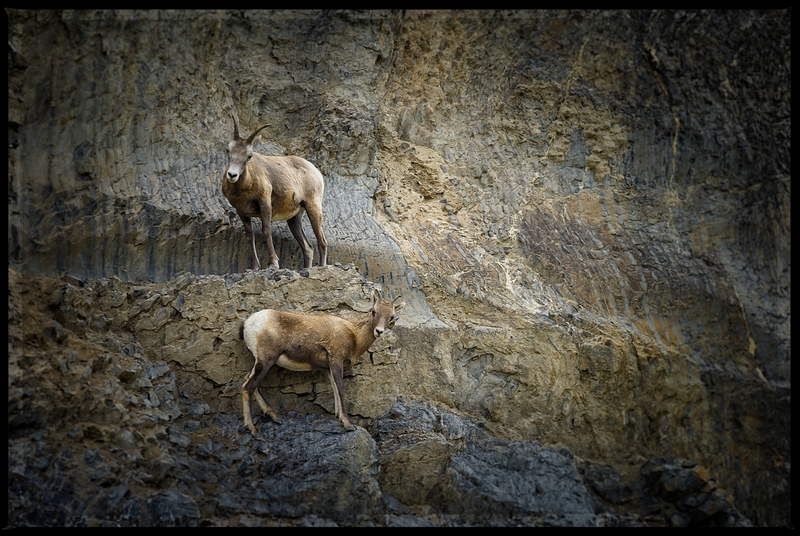 I ended up slightly higher than them but as it turned out it was exactly the right spot as they eventually wandered past just below me. The light source was slightly behind them which allowed for a nice rim lighting effect that worked well in the post production work. I was careful to watch my camera setting so as not to blowout any highlights. According to my metadata the total sequence lasted 3:48 sec so it was quite quick but it was well worth the climbing to this precarious perch I shot from. Lightroom 5 does the vast majority of my post production work. There is no specific workflow that I do its always done by perception and having a sense of what each image portrays to me. At capture I shoot manual and change my settings quite regularly almost frame by frame. When looking through the viewfinder and framing the image, I almost always I have a particular idea how I want the image to look when its done and printed. In this case almost every frame has some in camera adjustment as I shot from splendid warm highlights to high contrast shadow. This one facet of shooting causes me to adapt my post production so that a sequence of images can translate into a similar look and feel, if a sequence is what I desired. I started using OnOne software just over two years ago and its used mainly to finish and to render a more dynamic look in an image. There is an amazing set of filter that can evolve images in an endless number of ways and with each filter there is a complete set of control to customize the effect. In my images a softer more natural look with a slightly greater dynamic range is what I was trying to accomplish here. This a before, completed in LR5 and after using OnOne software. When studying processing I surf the net visiting a variety of photographic and photo competition sites. I look for trends that I like but mostly dislike. I’ve found there is a strong tendency to have images with over pushed sharpening which makes them loose there reality and become to digitized in their feel. When I analyze its more to confirm what I’m visualizing for my images thats important. One must consider and recognize with any desired processing technique it really boils down to beauty is in the eye of the beholder. I just participated in the “fivedayblackandwhitechallenge”. This event took place on Facebook and the idea was to create a chain of willing photographers to share 5 images from their portfolios and to invite 5 other photographers into challenge to perpetuate the event. On Oct 21 I was invited in by Anil Sud a good friend and mentor who is an amazing photographer in his own right. A special Thank You for that. So the question became what will I bring to the table. On a weekly basis I share a fair bit on Facebook so what would be the idea behind the images I was about to show for this challenge. My thoughts became one of newness. I spent time and looked at some of the images that people were post I realized they were from all over the world so I knew there was a larger audience pool. I decide to share some new images and processing concepts to see what comments this broader audience would yield. My first image was posted on Oct 21. This was a shot taken at the Leo Mole sculpture garden in Winnipeg. When I first saw this original colour image I liked the contrast that existed between the dark greens, dark clear waters and the light yellow lilies. 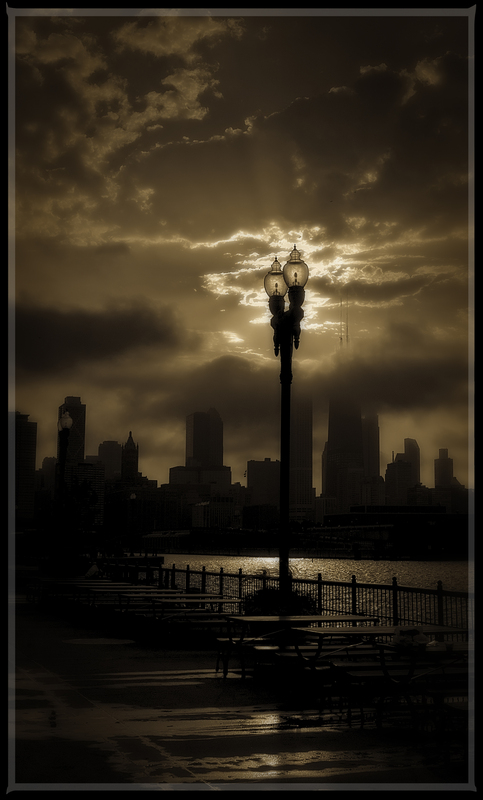 When I loaded it into LR5 and did a basic B&W conversion, based on a preset I created, I discovered much more. 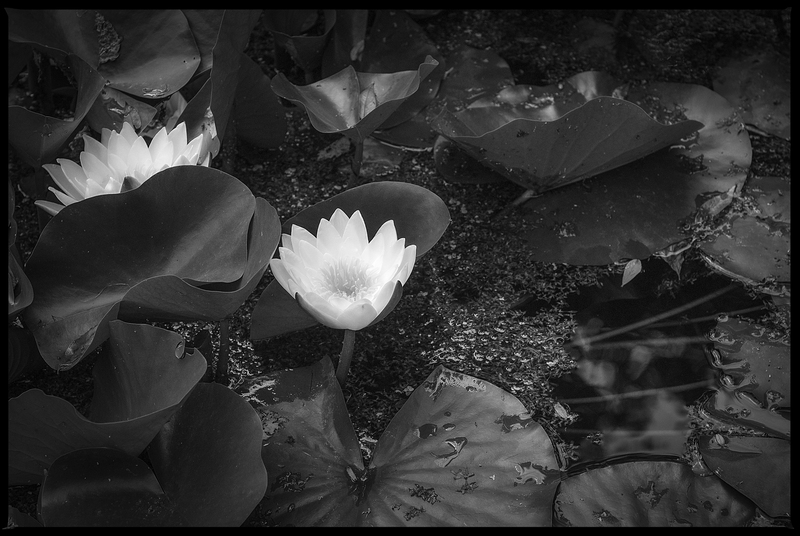 In B&W this image shows a tremendous amount of character in the depth of blacks in the matte leaves, the bubbles on the waters surface and of course the subtle details of the flowers that once you look into them you see more and more of the details that first look appear to be slightly over exposed. Captured at the Leo Mole Gardens, Winnipeg, Canada. My second image was posted Oct 22. This was a shot taken in North Eastern Alberta at Elk Island. This location became a favorite haunt of mine for about five years. Arriving predawn I would walk among the bison sleeping in the in the meadows and trees. I got quite used to them over the years and I had a good understanding of their body language so I was comfortable walking among them, stupid maybe, but it allowed me to get some very peaceful morning shots. This was one taken just as the bison were awakening. The setting was very nice with the edge of a forested area behind adding some nice light and vertical contrast to the dark animals and tall light grasses. Captured at Elk Island, Alberta. My third image was posted on Oct 23. This was taken in the Rockies near Jasper, Alberta. I was on a two day hike in the mountains and I came upon this small alpine lake. 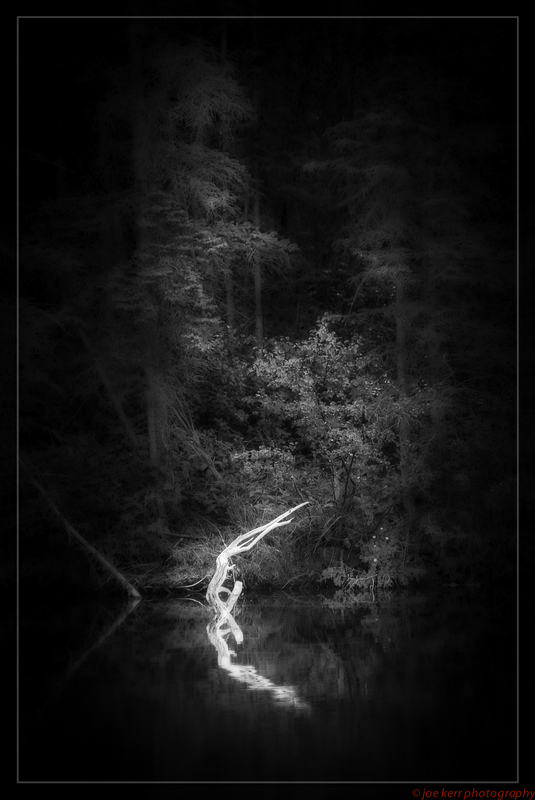 Along its shoreline were the roots of fallen trees that had been bleached by the sun and waters. The white sculptural roots strictures were a beautiful contrast to the dark green of the forest and the emerald green waters. The B&W conversion allowed even more depth and the selective highlights I chose created a nice “S” curve to the composition. Taken at an alpine lake near Jasper, Alberta. My fifth and final post was on Oct 25. With an international group I thought I would end it with an iconic symbol of the Canadian Prairies and take a step back in time when the history of our country was just being written. 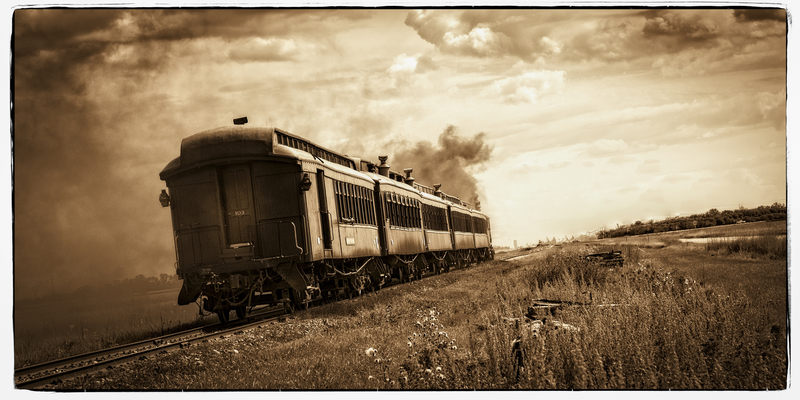 The Iron Horse is a imposing machine of iron and steel with a belly full of fire and boiler full of steam on the brink of catastrophe, yet, it intimately wove a steel thread that forged our culture and heritage from coast to coast. 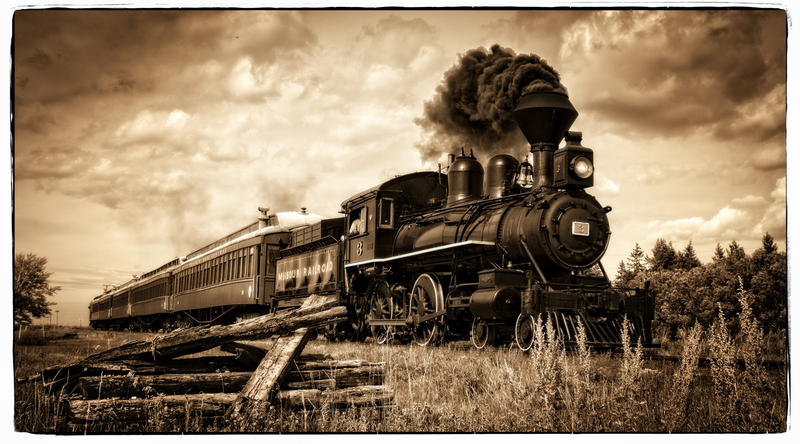 The Prairie Dog Central is the oldest functioning steam locomotive in North America, circa 1882, which still runs today. Its an amazing sight to behold as this Hollywood star steams across the prairie landscape as its black smoke plum dissipates into the abyss of the westerly prairie winds. I apologize that I was posting two images but I thought its was appropriate as they symbolize the coming and going of an era in early Canadian history. The five colleagues I invited were Alex Morrison ( About Nature Photography ), Tse Li Luk ( Tse Li Luk photography ), Hans Arnold ( Hans Arnold Photography ), Keith Levit ( Keith Levit Photography ) and Rodney Braun ( Rodney Braun Photography ). So this concluded my posts for the challenge. During my five days I was determined to share comments with as many photographers as possible. I search “fivedayblackandwhitechallenge” for the five days to see other peoples works and give comments when I was inspired by their images to do so. I must have “liked” upwards of 100 posts and commented on 20-25 that were outside of the community I already knew. There were some great images. I guess I was an anomaly by doing this but I thought sharing opinions would be something that most would look for. Unfortunately on the receiving end my images rarely earned any comments outside of my known friends and colleagues, which I really appreciated, but it was a bit of a disappointment not hearing from photographers from other countries. So, would I do it again, of course I would… its a joy to share the art you create. When I spoke to Rosemarie & Pat Keough about joining in on the fivedayblackandwhitechallenege they gratefully declined because in a few short days they are leaving on another amazing photographic expedition that will see them on a return journey to Antarctica and then on to South America to venture up the Amazon River. I’ll look forward to learning more about these amazing expeditions in the future. Rosemarie told me about an exciting recent development regarding their book (tome) entitled “Antarctica”. She wrote “Big news for us is that the prestigious Arts + Auction magazine, in its current international edition, highlights our photographic tome Antarctica as being one of the “Three Classics” together with Sierra Nevada: The John Muir Trail by Ansel Adams (1938) and Henri Cartier- Bresson’s The Decisive Moment (1958).” Attach is the pdf of the article “Snapshot of Photography Books, The Top Shelf.” Good company indeed! You can read more about their amazing books and travels by clicking on the link above. I’m look forward to the next challenge.